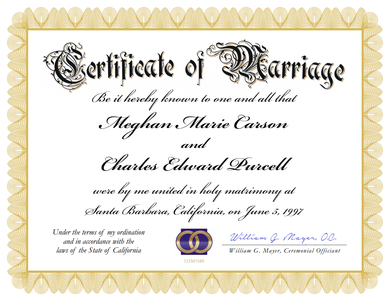 Looking for the perfect personalized certificate to commemorate a marriage ceremony or renewal of wedding vows? We offer this distinctive, fully personalized parchment document, suitable for framing. We include the names of both spouses in elegant formal lettering, along with the name of the Marriage Officiant (who may also sign the document), and the date and location of the ceremony. The marriage certificate heading reads "Certificate of Marriage." The vow renewal certificate heading reads "Renewal of Vows." This keepsake marriage certificate is available to any Wedding Officiant. The document includes the symbolic golden rings logo as shown in the sample. Please allow 4 to 6 business days for processing. This souvenir certificate may be used to commemorate a wedding, commitment ceremony or renewal of vows, regardless of the date or location. This document is NOT A MARRIAGE LICENSE. If you wish to obtain a marriage license, please contact your local county clerk, or click here to obtain a marriage license online from First Nation Church. The following fields are personalized: both spouse names, the location of the wedding, the date of the wedding, and the name of the Wedding Officiant (ceremonial minister). In addition, a blank line is provided for the Officiant's signature; as such, the certificate should not be shipped directly to the couple. The perfect gift from the Wedding Officiant to the happy couple! We hate to ask again ... are you sure about the date? Did you spell the city and state correctly? Last chance to review the info!